SAN DIEGO--(BUSINESS WIRE)--Apr. 29, 2016-- ACADIA Pharmaceuticals Inc. (NASDAQ: ACAD), a biopharmaceutical company focused on the development and commercialization of innovative medicines to address unmet medical needs in central nervous system (CNS) disorders, today announced that the U.S. Food and Drug Administration (FDA) has approved NUPLAZID (pimavanserin) for the treatment of hallucinations and delusions associated with Parkinson’s disease psychosis. 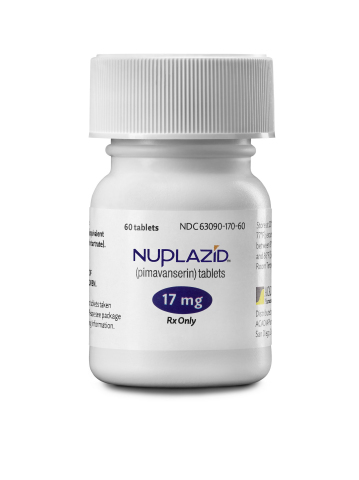 In 2014, the FDA designated NUPLAZID as a Breakthrough Therapy for this condition. NUPLAZID is the first and only medicine to be approved by the FDA for this indication. NUPLAZID is also the only drug approved by the FDA that preferentially targets 5-HT2A receptors. These receptors are thought to play an important role in Parkinson’s disease psychosis. The unique pharmacology of NUPLAZID establishes a new class of drug - selective serotonin inverse agonists (SSIA) - by not only preferentially targeting 5-HT2A receptors but also avoiding activity at dopamine and other receptors commonly targeted by antipsychotics. Typical Parkinson’s disease therapy consists of drugs that stimulate dopamine to treat patients’ motor symptoms such as tremor, muscle rigidity and difficulty with walking. NUPLAZID does not interfere with patients’ dopaminergic therapy and therefore does not impair their motor function. According to the National Parkinson Foundation, about one million people in the United States and from four to six million people worldwide suffer from Parkinson’s disease. An estimated 40 percent of these patients have Parkinson’s disease psychosis, which is characterized by hallucinations and delusions, is associated with significant caregiver burden, and is a major reason for nursing home placement among Parkinson’s patients. The FDA approval of NUPLAZID was based on data from the pivotal Phase III Study -020 and other supportive studies, representing the largest research and development program in Parkinson’s disease psychosis to date. In Study -020, NUPLAZID significantly reduced the frequency and severity of psychotic symptoms compared to placebo on the Scale for Assessment of Positive Symptoms – Parkinson’s Disease (SAPS-PD). This benefit was achieved without impairing motor function. The most common adverse reactions (≥5% and twice the rate of placebo) in this study were peripheral edema (7% NUPLAZID vs 3% placebo) and confusional state (6% NUPLAZID vs 3% placebo). Results of Study -020 were published in The Lancet. Please see full prescribing information at www.nuplazid.com. ACADIA plans to make NUPLAZID commercially available to patients suffering from hallucinations and delusions associated with Parkinson’s disease psychosis in the United States in June 2016. ACADIA is committed to ensuring that patients in the United States who are prescribed NUPLAZID are able to access the medicine and receive the ongoing support they may need. ACADIA will be introducing NUPLAZIDconnect, a comprehensive program that provides financial assistance and/or access assistance to patients, their caregivers, and physicians. NUPLAZID will be available through a specialty pharmacy network. Patients and physicians can access information about NUPLAZID and NUPLAZIDconnect by visiting www.nuplazid.com or calling 844-737-2223. Drug Interactions: Strong CYP3A4 inhibitors (eg, ketoconazole) increase NUPLAZID concentrations. Reduce the NUPLAZID dose by one-half. Strong CYP3A4 inducers may reduce NUPLAZID exposure, monitor for reduced efficacy. Increase in NUPLAZID dosage may be needed. Dosage and Administration: Recommended dose: 34 mg per day, taken orally as two 17 mg tablets once daily, without titration. ACADIA will hold a conference call and webcast on Monday, May 2, 2016 at 8:30 a.m. ET to discuss the FDA approval of NUPLAZID. The conference call may be accessed by dialing 844-821-1109 for participants in the U.S. or Canada and 830-865-2550 for international callers (reference passcode 3844233). A telephone replay of the conference call may be accessed through May 16, 2016 by dialing 855-859-2056 for callers in the U.S. or Canada and 404-537-3406 for international callers (reference passcode 3844233). The conference call also will be webcast live on ACADIA’s website, www.acadia-pharm.com, under the investors section and will be archived there until May 16, 2016. NUPLAZID is the first FDA-approved treatment for hallucinations and delusions associated with Parkinson’s disease psychosis. NUPLAZID is a non-dopaminergic, selective serotonin inverse agonist preferentially targeting 5-HT2A receptors that are thought to play an important role in Parkinson’s disease psychosis. NUPLAZID is an oral medicine taken once a day with a recommended dose of 34 mg (two 17 mg tablets). ACADIA discovered this new chemical entity and holds worldwide rights to develop and commercialize NUPLAZID. Statements in this press release that are not strictly historical in nature are forward-looking statements. These statements include but are not limited to statements related to the benefits to be derived from ACADIA’s product candidates, including NUPLAZID (pimavanserin); whether NUPLAZID represents a paradigm shift in the treatment of Parkinson’s disease psychosis (PDP) patients; whether NUPLAZID is a breakthrough treatment that works in a whole new way; whether NUPLAZID establishes a new class of drug; whether NUPLAZID represents a major medical advancement for PDP patients who suffer from hallucinations and delusions; whether a therapy to treat the hallucinations and delusions associated with PDP without worsening motor symptoms can significantly impact the lives of Parkinson’s patients and their loved ones; ACADIA’s plans to make NUPLAZID commercially available in the United States, including the timing thereof; whether ACADIA will be able to ensure patients have access to NUPLAZID; and the assistance that will be available to patients, their caregivers and physicians from ACADIA, including through NUPLAZIDconnect. These statements are only predictions based on current information and expectations and involve a number of risks and uncertainties. Actual events or results may differ materially from those projected in any of such statements due to various factors, including the risks and uncertainties inherent in drug discovery, development, and commercialization, whether NUPLAZID receives adequate reimbursement from third-party payers, ACADIA’s ability to establish an adequate specialty pharmacy network to distribute NUPLAZID, the degree to which NUPLAZID receives acceptance from patients and physicians for its approved indication, and the fact that past results of clinical trials may not be indicative of future trial results. For a discussion of these and other factors, please refer to ACADIA’s annual report on Form 10-K for the year ended December 31, 2015 as well as ACADIA’s subsequent filings with the Securities and Exchange Commission. You are cautioned not to place undue reliance on these forward-looking statements, which speak only as of the date hereof. This caution is made under the safe harbor provisions of the Private Securities Litigation Reform Act of 1995. All forward-looking statements are qualified in their entirety by this cautionary statement and ACADIA undertakes no obligation to revise or update this press release to reflect events or circumstances after the date hereof, except as required by law.